by Lee Blessing. At the Keen in a production directed by Jonathan Silverman. Photo by Carol Rosegg. In Lee Blessing’s vision in “A Walk in the Woods,” at the Keen through October 18th, arms negotiations are a game leading to “Nyet” on one side, and “No” on the other. Irina Botvinnick (Kathleen Chalfant) understands this. John Honeyman (Paul Niebanck), her naive counterpart from the USA, expects to save the world from itself. Detente is an old-fashioned word. It melted with the ice of the Cold War. 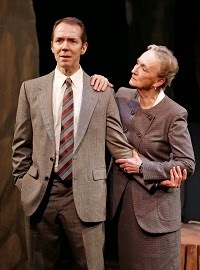 Blessing’s play, ably directed by Keen’s Artistic Director, Jonathon Silverstein, is about people–specifically about two people whose business is politics and whose mission is useless. The two are negotiators for the great and well-armed superpowers of the Soviet Union and the United States of America. Chalfant’s Irina is charming as she eggs Honeyman into trivial conversations as they walk and talk in a Geneva park. 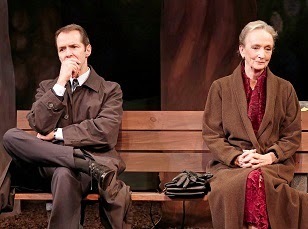 The play, which was nominated for both a Tony and the Pulitzer Prize in 1987, echoes he futility and frustration of arms-race peace talks. It also drags to a point where it loses focus and our interest. Is “A Walk in the Woods” dated in the post-Cold War era? Much of what it has to say about the unwillingness to scale down and give up weapons rings true. The opponents have changed shape and geography, perhaps. Despite its real-politik plot, however, the play lags. The leads are never anything but compelling to watch, but the outcome is evident and protracted. The costumes by Amanda Jenks and Jennifer Paar are lively, and provide a nice rhythm to the seasons of the plot. For more information on “A Walk in the Woods,” and the Keen Company, please visit http://www.keencompany.org/.